Get the new Fling logo! The annual Fling city logos are a great way to show your support for specific Flings (like the upcoming Minneapolis fling logo over in the right hand sidebar) - but now thanks to the creativity and design talent of Scott Weber we've got a logo for the Fling in general (isn't it fabulous!?). You should be able to save the image above and add it to your blog, just like you have other Fling logos. Thanks Scott! What's the deal with the spoon and cherry? The sculpture is one of the main focal points of the sculpture garden at the Walker Art Center. 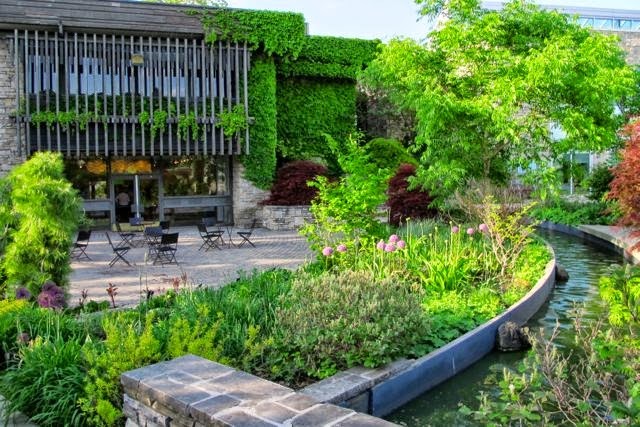 The sculpture garden at the Walker is one of the potential places on our list for the Fling - but we're not sure yet if we'll be able to fit it into our busy schedule. We will definitely let you know! 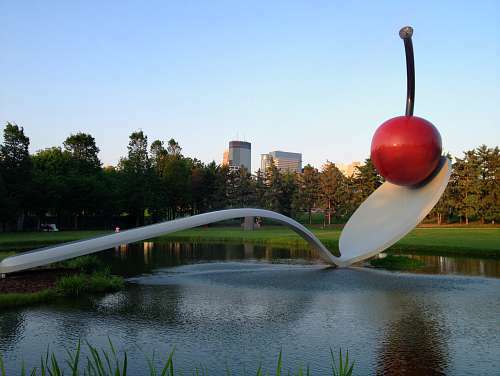 But if we aren't able to visit the Walker sculpture garden during the Minneapolis Fling, I highly recommend you visit on your own while you're here. It's not too far from where we'll be staying. You can add this badge to your site by right clicking on the badge image on our sidebar and selecting "Save Image As..."to save it to your computer. Then you can upload the image to your blog. Or you can choose "Copy Image" and paste it into a post or sidebar widget of your blog rather than uploading the image to your site. Just some of the samples our wonderful sponsors provided for Toronto Fling attendees! Photo from The Botanical Journey blog. Whether you provided cash sponsorship to help us defray costs, sent samples for our garden bloggers to try, or underwrote an event or a meal, as a sponsor of the Garden Bloggers Fling you made it all so much more possible. We literally could not have done it without you. In 2015, the organizers and attendee bloggers of the Toronto Fling were hugely grateful for your generous support – as new and repeat Friends of the Fling from both Canada and the United States. Our bloggers were over the moon that Lee Valley Tools was our Opening Night Event sponsor. Not only did Lee Valley provide the creative food and beverages for our evening – they held the party in the Lee Valley King Street store! Even non-blogging spouses were thrilled to be able to browse through the garden and woodworking tools and just general neat stuff. 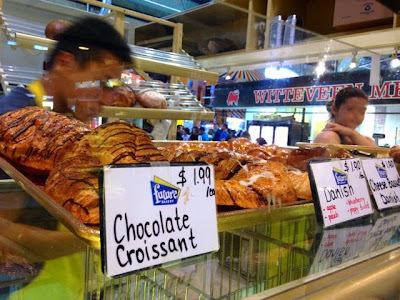 What's more, Lee Valley provided each blogger attending with a $50 gift certificate to shop with (and our visit coincided with a free shipping offer, great for long-distance and U.S. guests). 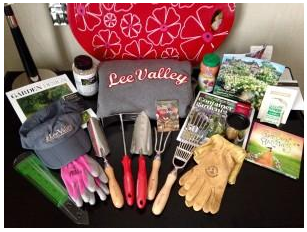 And if that weren't enough, we each went home with a big shopping bag full of wonderful Lee Valley-branded merchandise, including three beautiful hand tools (like this one), a stainless steel mug, the best folding cap ever, and the hoodie you can see in the pic at the top. A very big thank-you from us all. About Lee Valley Tools: Lee Valley is a family-owned business that has been serving users of woodworking and gardening tools since 1978. The Toronto Botanical Garden was our very first sponsor and our very last stop on the official Toronto Fling – as the site of our final dinner. Their support went far beyond the waiving of fees for the space, tables and chairs, and tableware, which significantly unburdened our budget. Throughout Fling the planning process, the TBG went out of their way to guide us and make our Fling special. They helped us find our caterer (thanks, L'Eat, you were wonderful – people still talk about the gourmet poutine). They organized musicians to play over cocktails. They brought in Betsey Price & Omar Hamouda of P & H Farms, regular vendors at the TBG Thursday organic farmers' market, who treated us to a tasty tasting. And who could forget the great presentation on container planting from the always informative, ever entertaining Paul Zammit. Moreover, they gave each of us this handy shoulder bag. We love you, TBG. 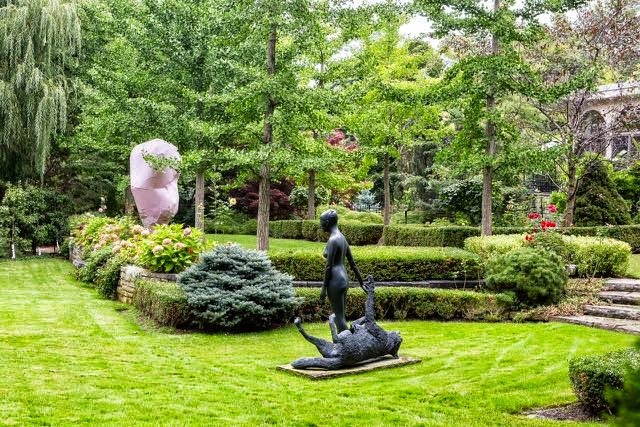 About the TBG: The Toronto Botanical Garden offers an array of 17 award-winning themed gardens spanning nearly four acres, designed to educate and inspire. Corona Tools has been a five-times sponsor of the Garden Bloggers Fling, for which we send thundering applause. This year, we were delighted to receive from Corona a cash donation towards costs, as well as a Corona ComfortGel Trowel and a ComfortGel Hoe & Cultivator for each of our bloggers. That box filled my entire front porch when it arrived! In addition, Corona donated a $150 gift certificate that one very happy blogger received in our draw. Corona Tools, you are a true Friend of the Fling. Thank you! About Corona Tools: Founded in the early 1920s, Corona, Inc. is a leader in the marketing and manufacturing of professional and consumer tools for the lawn and garden, landscape, irrigation, construction and agriculture markets. Gardener's Supply is another Fling sponsorship alumnus, and although Canadians aren't really their market, we were extremely happy that they agreed to come back to support the first Garden Bloggers Fling outside the U.S. The company provided both generous cash sponsorship and $250 in gift cards for our draw. The lucky winner felt herself to be very lucky indeed. From the Canadian Fling, merci! About Gardener's Supply: Gardener’s Supply has long been a socially responsible business, which we've expressed by supporting employee volunteerism, sourcing sustainable products and donating 8 percent of our profits back to the community. 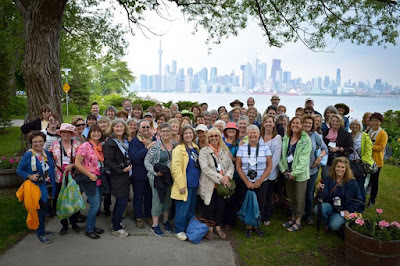 We approached the Royal Botanical Gardens early in our planning, and they were very receptive to welcoming our bloggers to the Laking Garden, as our first destination on our optional extra day in Niagara. Because of our early start, the RBG sponsored our breakfast on the bus, complete with some direly needed caffeine coffee, allowing us to spend as much time as possible looking at plants. We also want to thank the RBG for planting so many informative staff in the garden, just for our Flingers. (While we're at it, let's credit them with stopping the rain in time for us to enjoy the irises.) Thanks! 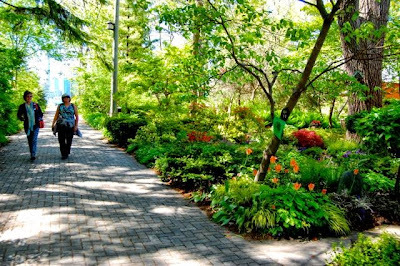 About the RBG: Royal Botanical Gardens (RBG) is the largest botanical garden in Canada, a National Historic Site, and registered charitable organization with a mandate to bring together people, plants and nature. Three-times returning sponsor Blooms of Bressingham has traditionally provided plants as part of their sponsorship. This year, however, as the Fling was in Canada and most of our attendees were from the U.S., it was logistically impossible to move plants across borders. We were very grateful that they remained a loyal supporter with a cash donation. We also love one of their most famous introductions, the 'Rozanne' geranium – which is already in many of our gardens. About Blooms of Bressingham: Blooms of Bressingham was founded by father and son Alan and Adrian Bloom, prolific English plantsmen who have been responsible for introducing over 200 perennial cultivars over the company’s 100 year history. The Toronto Fling also welcomed back Dramm as three-times returning sponsor. Like all cash sponsors, their donation helped defray costs such as buses and meals – allowing us to keep registration fees low and make the Fling accessible to more garden bloggers. We were also happy to receive Dramm watering products for draw prizes, including this Revolution Spray Nozzle (which I lusted for the moment it arrived – I have a similar Dramm hand sprayer with fewer spray options, and just love their one-touch thumb control). Lust and love. You can't get much better than that. About Dramm: Dramm Corporation has been a leader in watering tools and accessories for over 70 years. It all started with a man named John G. Dramm and his invention that revolutionized the way greenhouses; nurseries and gardeners water their plants. 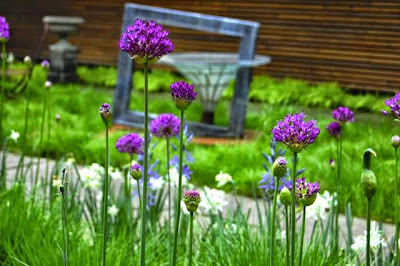 Garden Design magazine is a second-time Fling sponsor and contributed in a number of ways. They gave us a cash donation, they provided free issues of their amazing magazine for all our bloggers, as well as for garden owners and other helpers. And they included a special offer for first-time subscribers in each copy of their magazine. 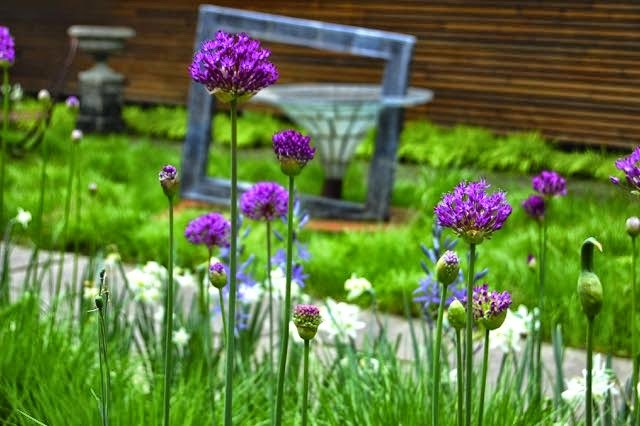 Both beautiful and practical, Garden Design is a great read for garden inspiration. Last but not least, the magazine publisher Jim Peterson came on the Fling as a paid attendee. We love you many times over, Jim and Garden Design! About Garden Design: "The new Garden Design magazine is so highly, gloriously visual that it’s almost fragrant. Its 132 pages join horticulture with the human-made, crisscrossing the U.S. for backyard glamour and expert advice, species spotlights and design tips." When it comes to garden plants, there are few recognized brand names – but one of them is Proven Winners. As another five-times sponsor, Proven Winners is also a celebrated Friend of the Fling. Not only did they provide cash support, they make a little video of 2016 plant introductions, just for us, including 'Holy Moly' calibrachoa, which is proving to be a tough customer under the toughest conditions when tested it in my garden this year. (Not in the video, but another tough guy in Helen-proof testing has been their 'Endless Illumination' browallia – can you tell I'm a shade gardener?) Thank you, Proven Winners, for your support – and for these proven winners. About Proven Winners: Proven Winners searches the world to find and select plants which are clearly superior to others of their type in our trials in Michigan, New Hampshire, California, Germany, Japan, and Florida. It isn't only the big guys who reach out to support the Fling. An early sponsor has been the small Canadian company of garden pros Barbara and Maritta, White Clover Gardening. For their own use, they created a hardy garden bag for long tools (I reviewed it here), and offered four draw samples for our garden bloggers to try. That's big support from a little company, for which we send huge thanks! About the White Clover Gardening Tool Bag: Custom designed to fit long-handled tools. This is truly a Canadian product! Heavy duty, outdoor grade canvas milled in Quebec, entirely manufactured in eastern Ontario and screened in Toronto. You can't get any more Canadian than that. A big box of high-quality rain gauges arrived from Bonnie Plants, with one for every blogger – and extras to share with our Fling garden homeowners. We're already finding them useful. Thank you! 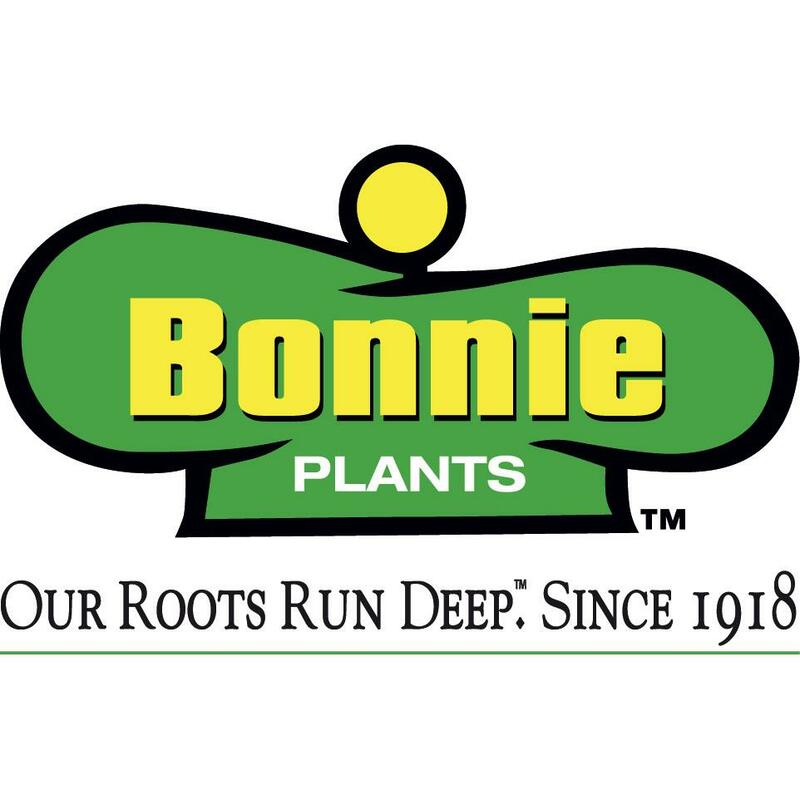 About Bonnie Plants: A national plant wholesaler based in Alabama, Bonnie Plants supplies retail stores all over the United States. You may recognize us by our green hat logo and our biodegradable pots. 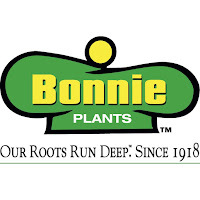 If you’re a Bonnie gardener, you know us for our quality plants—the best vegetable, herb, and flower plants available. Further thanks go out to all the companies who provided gifts for our gardeners or financial support for the Toronto Garden Bloggers Fling. Check out the links to see what they're all about! 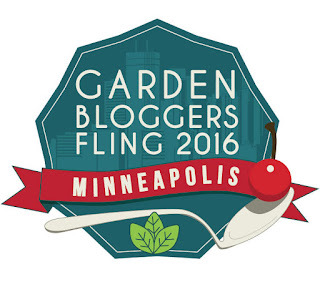 Save the date: Garden Bloggers Fling is heading to Minneapolis! On behalf of the Minneapolis Garden Blogger's Fling planning committee, I would like to formally announce that the dates for the 2016 Fling are July 14-17, 2016! We can't wait! 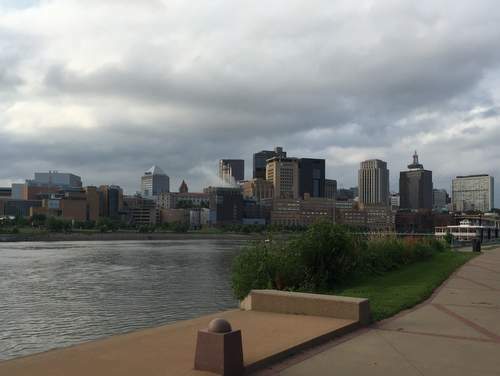 In Minnesota we're lucky to have no only one, but TWO beautiful cities - Minneapolis and St. Paul, also known as the Twin Cities. 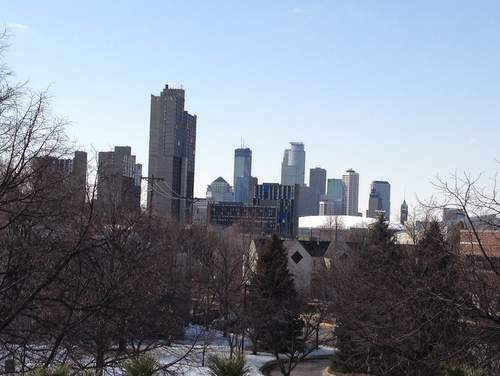 The Twin Cities are close neighbors; it’s only about a 15 minute drive between the two downtowns. Even though we’re hosting the fling in Minneapolis, we'll be visiting gardens in both cities. 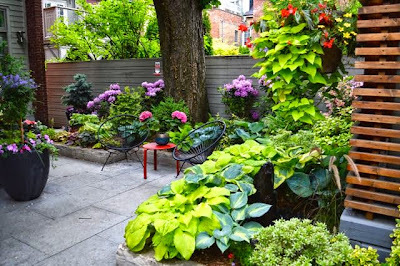 In addition to seeing a variety of urban gardens, we'll be exploring some amazing suburban gardens too. As much as we’d like to guarantee to have perfect weather when you come, we can never plan anything around the weather in Minnesota (to give you an example: on Saturday it was almost 100F... and when I got up this morning, it was only 50! Haha!). But don't worry, we'll let you know as the time gets closer what the weather forecast is predicting. In the mean time, think cool-weather thoughts. 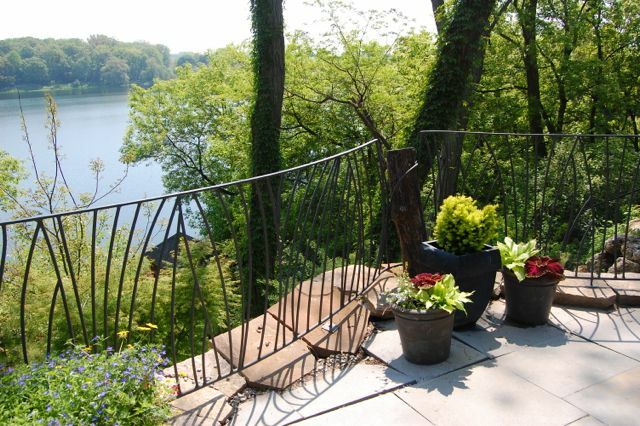 We're busy planning away and putting together a list of gardens we think you'll love! So, save the date and we hope to see you in Minneapolis in July! The Toronto Fling has flung, and everyone who came seems to have had a Flingtastic time! That's gratifying for us on the organizing committee, and we thank you all so much for coming. 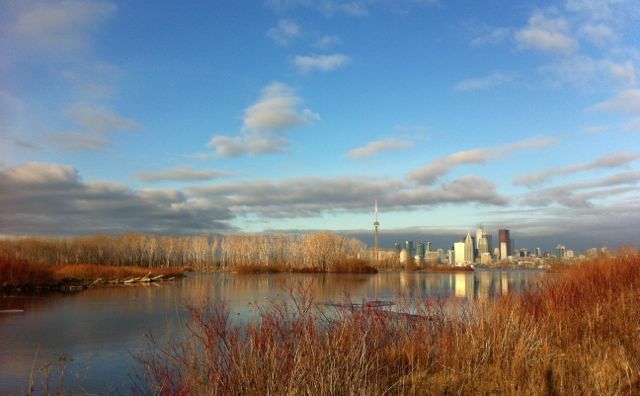 Here are links to our bloggers' posts about their experiences in Toronto. 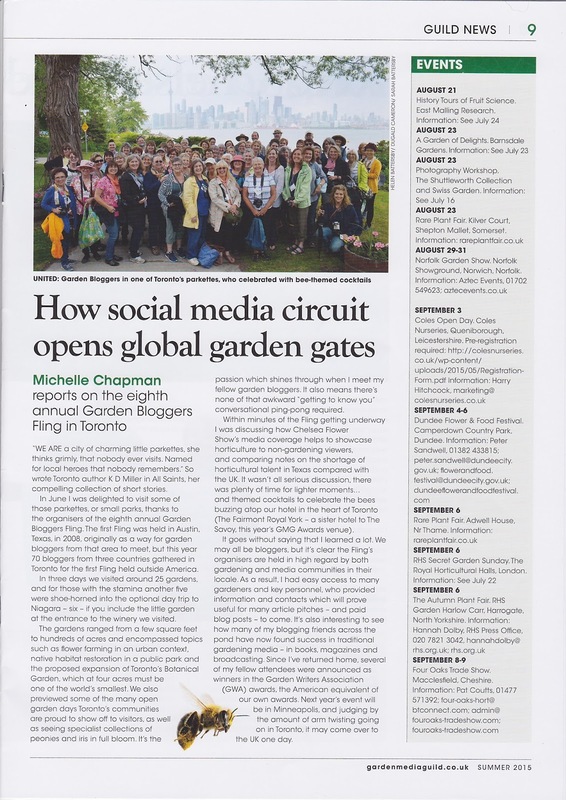 Much more was shared on Twitter and other social media, including the Garden Bloggers Fling Facebook group page. Although hashtags don't live forever, look for the #GBFling15 hashtag on Facebook or on Twitter and on the lovely images from the #GBFling15 tag on Instagram. P.S. Flingers....pass the word about this very cool company!" To read the article, open the image below in a new tab and use the magnifier. 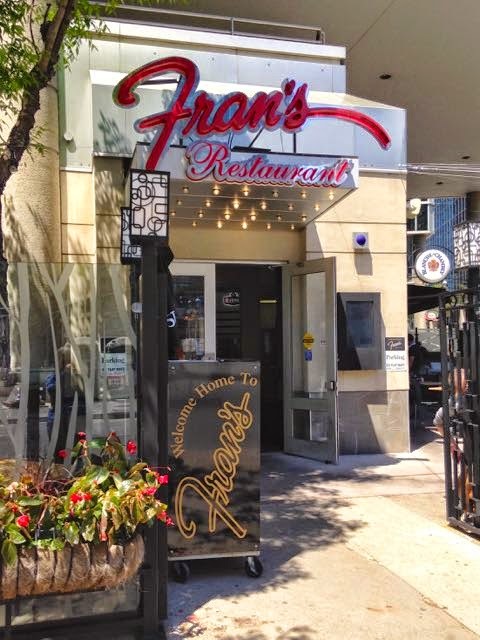 A walk along Front Street makes dining spots easy to find. 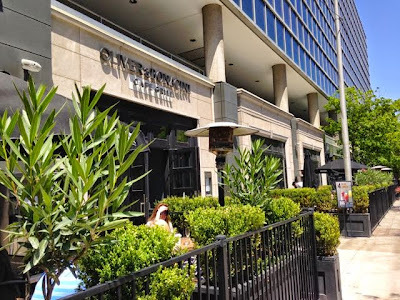 Toronto has no shortage of good restaurants. 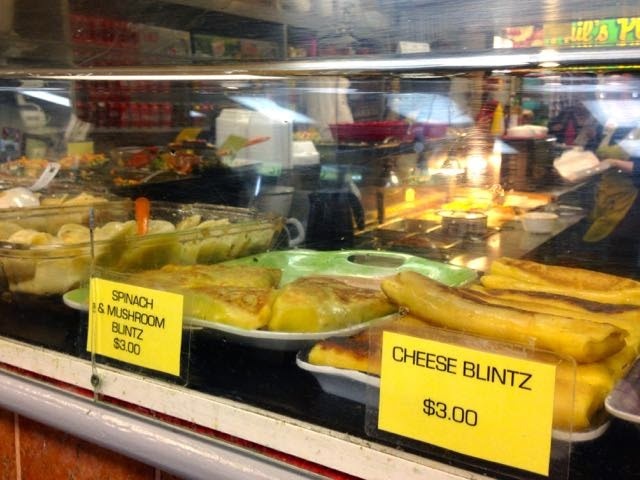 If you like to eat, no matter what you like to eat, you'll find it here. 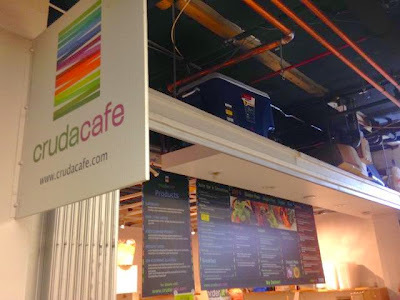 Every ethnicity, meaty or meatless, raw or cooked to perfection. You name it. But if you want to make dinnertime easy, simply walk east along Front Street, turning left at the Royal York's front door. You'll find three large, well reviewed restaurants five minutes away in the block at Yonge and Front, all with large patios – or head further east for more options. 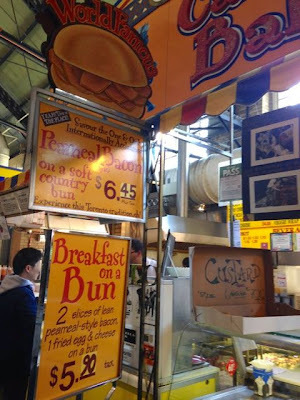 Breakfast is another thing that Toronto does well. The Royal York's awnings in the background. 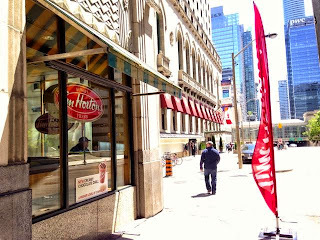 Tim Hortons, an American-owned Canadian tradition, Timmie's is cheap and cheerful and about a minute's walk north of the hotel's west exit. Get breakfast sandwiches, yogurt, bagels and donuts for just a few dollars "to go." A Canadian coffee with two creams and two sugars is a "double-double." This is coffee for people who don't like Starbucks. I find their tea "bag in" vs "steeped" (that's hot tea, to our American friends) to be quite drinkable. Tim's opens at 7 am. York Street Café, just across York Street at the Strathcona Hotel, has both a breakfast buffet and à la carte menu. Opens 6:30 am weekdays; 7 am on weekends. 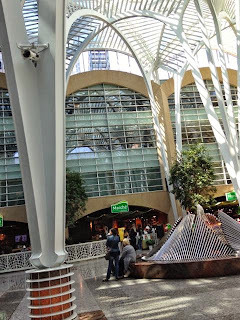 Marché, in the Brookfield Place atrium – which is a cool piece of urban architecture – accessible via the entrance just this side of the Hockey Hall of Fame. Self serve; lots of options. Opens at 7:30 am. 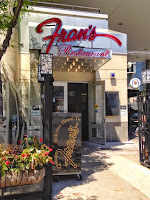 Fran's, a modern outlet of a classic, big breakfast Toronto diner (check out one of the originals on College St. west of Yonge sometime), is just a block east of Yonge on Front Street. Opens at 6:30 am. Remember our early-morning walk to St. Lawrence Market for breakfast on Saturday. Meet me in the lobby, ready to leave at 6:45 am – it's a 15-minute walk. Bring cash to make your life easy. Let me know if you're coming! Here are just some of the options there – pictures = 1,000 words. Toronto Fling: What to do besides Flinging? It's easy to find things to do in Toronto to supplement Fling activities – or occupy yourself while significant others look at gardens. And I've made it even easier with this link-laden post. What we lack in images, we make up for in online connectivity. Explore away! If you're staying at the Royal York Hotel, you can walk almost everywhere. Two of the closest attractions are the Hockey Hall of Fame or the new-just-last-year Ripley's Aquarium of Canada. It's best to pre-purchase aquarium tickets online. Another one-of-a-kind destination nearby is the Museum of Inuit Art near the lake on Queen's Quay (pronounced "key"). The terrifyingly brave might try EdgeWalk at the iconic CN Tower (note, it's CN or Canadian National, not CNN), also walkable from the Hotel. EdgeWalk makes my hands sweat just thinking about it. Toronto Tourism calls it one of the city's must-see attractions. But you don't have to go outside to find the tower view impressive. On a clear day, you can see the plume from Niagara Falls. The revolving restaurant isn't cheap, but the food isn't bad. If you go to dine, do it near sunset. You could also walk to our Frank Gehry-designed Art Gallery of Ontario on Dundas Street. The Emily Carr exhibit is among the shows running when you're here. Around the corner on McCaul is one of Toronto's controversial love-or-hate bits of architecture, The Sharp Centre for Design, main building for the art school OCAD University. I'm a lover. Let's see how you feel. On your way, you might catch Artist Textiles: Picasso to Warhol at the Textile Museum of Canada – on Dundas Street, just north of our photogenic Toronto City Hall. 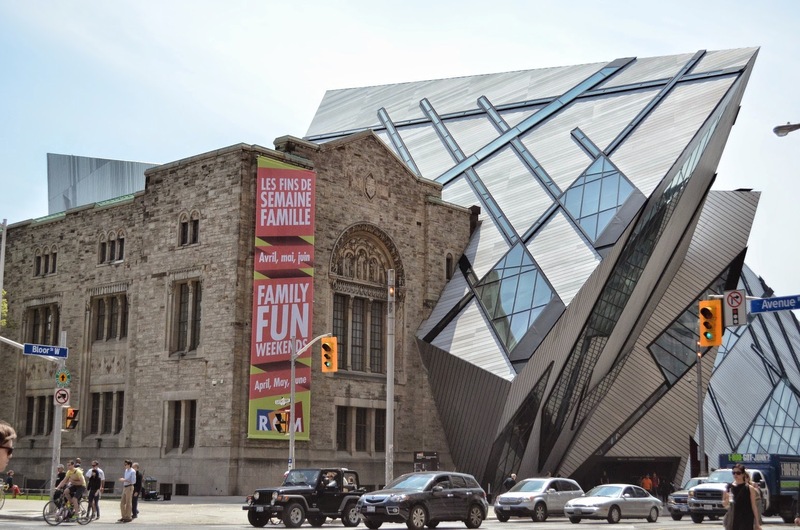 A little further north, along "Fashionable Bloor Street," and nudging elbows with the likes of Gucci and Chanel, is The Royal Ontario Museum (ROM). You'll be in time to catch a number of exhibitions – and, if you're here after June 13th, there's the Pompeii show. You can decide whether you're a "lover" or "hater" of the crystal addition to the architecture. Guess which camp I'm in. Across University Avenue from the ROM is The Gardiner Museum of Ceramic Art. 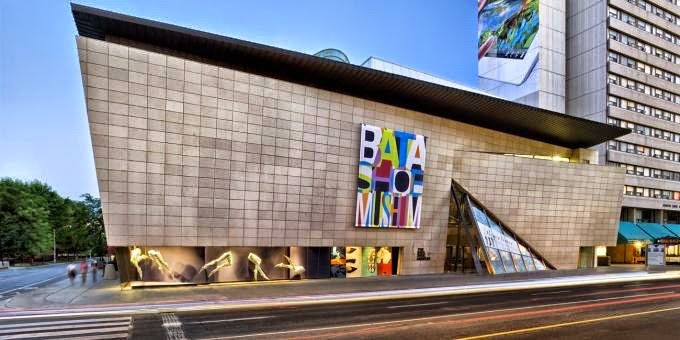 A few blocks west on Bloor, find the small but fascinating Bata Shoe Museum. Their first 20th Anniversary show is on men in heels. Other shows are ongoing, and their permanent collection is unique. Other museums downtown include photography at the Ryerson Image Centre, the new visitor centre at Fort York National Historic Site, and Toronto's "castle" Casa Loma with Spadina House just next door. To reach the last two, get off at my favourite subway stop, Dupont. If you don't mind going a bit further afield to see things "blowed up good" the Mythbusters show is on at the Ontario Science Centre. Get there via transit (aka the TTC, Toronto Transit Commission). In that general nabe is the Aga Khan Museum which we'll also visit on our Fling. Titanic, the Musical – the Tony-award-winning musical – will be playing at the Princess of Wales Theatre on King Street, not far from our hotel. It stars Canadian tenor superstar, Ben Heppner. A short jaunt south from the hotel, the Air Canada Centre hosts Ed Sheeran on June 6th. The rest of the June calendar includes Rush (June 17 & 19) and Bette Midler (June 20). 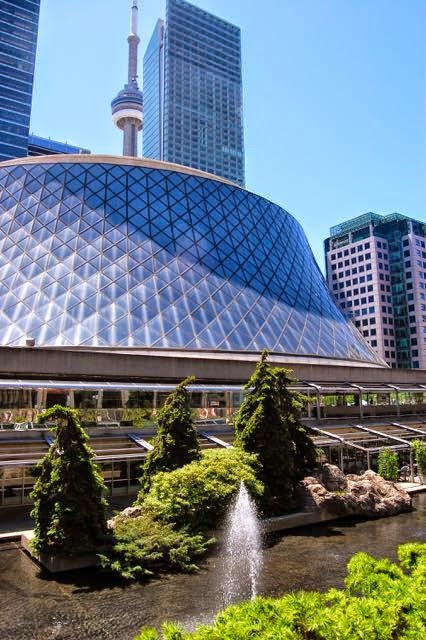 Roy Thomson Hall, the concert hall of the Toronto Symphony, has a variety of performances that might appeal to you. If you'll be here as early as June 3rd, extreme climber Will Gadd, National Geographic Explorer of the Year, talks about his climb of a frozen Niagara Falls. During your visit, The National Ballet of Canada will be performing Sleeping Beauty, one of their gems, at the Four Seasons Centre for the Performing Arts. 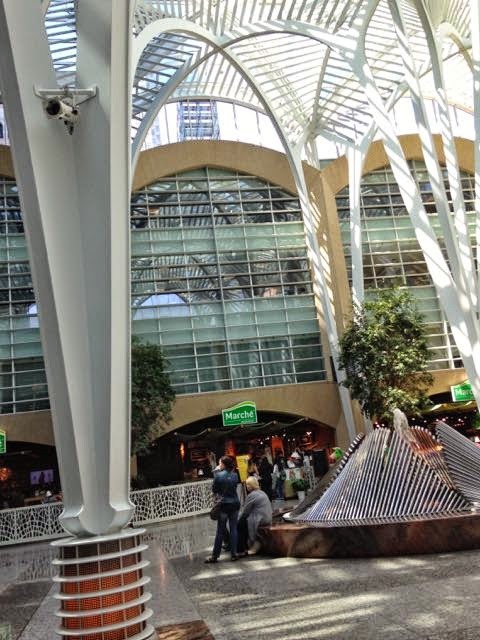 If you're here by lunchtime, Wednesday, June 3rd, you might be able to enjoy a free lunchtime music concert at the Four Seasons Centre, also the home of the Canadian Opera Company (though opera season is over for the summer). 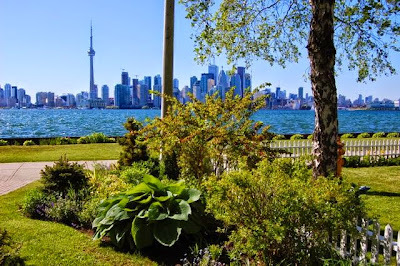 Toronto is situated on the vast freshwater sea known as Lake Ontario, and the waterfront makes an interesting stroll from one end of the city to the other. 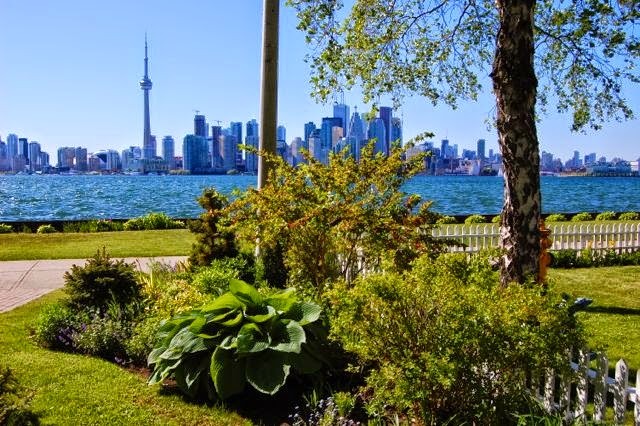 You can rent a bike and explore along the Martin Goodman Trail which runs close to the waterfront through city and countrified paved trails. 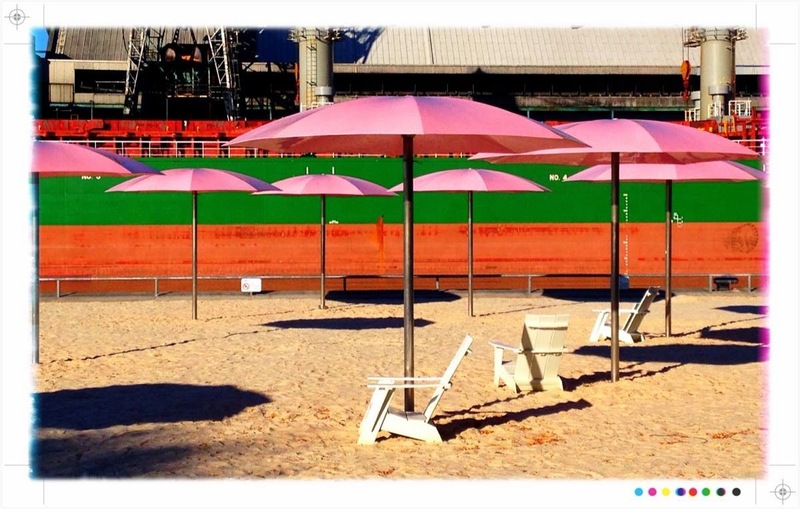 One stop might be the cool park known as Sugar Beach, right up against the docklands. 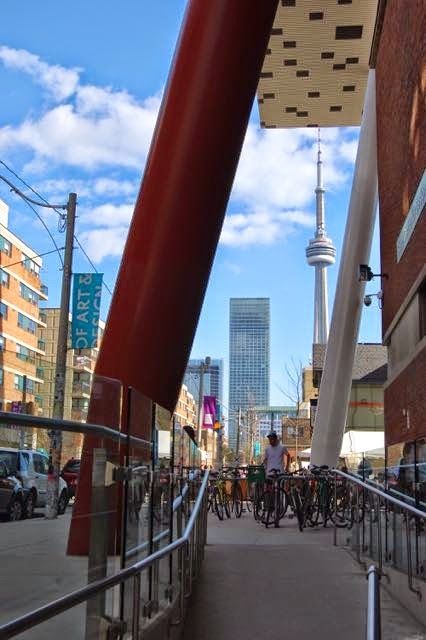 About a 10-minute walk from the hotel is Harbourfront Centre with maker spaces (such as glass blowing), the Power Plant art gallery, and just general cool walking around. You can take a harbour tour or even rent a boat and sail yourself. Really, there are way too many to cover here. But here are a few close to the centre of town. A must-see is the Distillery Historic District – a converted Gooderham and Worts distillery often used as a movie set. Wednesday nights are music nights from 6 pm. Two micro-breweries (one for beer, one for saki) and an excellent performing arts theatre are among the many attractions. King Street West – and we'll walk along this on our way to opening night at Lee Valley – is heart of the entertainment district, with a restaurant row of places to eat. Roy Thomson Hall (see above) is here, as is the Princess of Wales Theatre. The Bell Light Box is home base for the Toronto Film Festival (come back in September for that!). Queen Street East and West. Ride the streetcar from one side of the city to the other (get a TTC transit day pass; or if you'll regularly use transit for more than 4 days, the weekly pass might be the best deal for hop-on-hop-off travel). The east end is the city's Beach neighbourhood – my neck of the woods. Once waaaaaaaay out in the country, now absorbed into the fabric of the city. 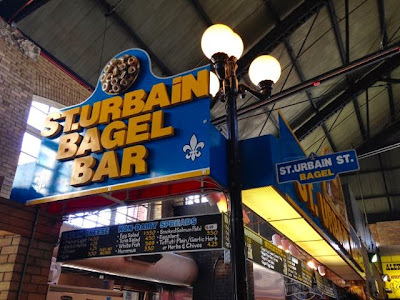 The west side takes you into more Bohemian Toronto. East of Spadina has been taken over by big-brand names, but still has a bit of its old roots. The street gets edgier as you head west. Wanna see a Blue Jays game (that's baseball, for the uninitiated), they'll be at the Rogers Centre, formerly known as the SkyDome, during Fling. Being a writer, I have to put in a plug first for the new gift shop at the Toronto Reference Library at Yonge and Bloor. It isn't the only reason to visit the Library – another is the Library's Arthur Conan Doyle Collection. The Toronto Eaton Centre. Eaton's is no more (Simpson's and Eaton's, both gone now, were Canada's Macy's and Gimble's), but the huge shopping galleria that still bears its name is a few blocks north of the hotel. Speaking of Saks (or I will be in a few sentences), the Hudson's Bay Company, just south of the galleria, will be Toronto's new Saks location, but check it out now for a Hudson's Bay blanket or souvenirs. Bloor-Yorkville, with the haute-est names in fashion, galleries, restaurants, and stuff. Holt-Renfrew is our version of Saks or Bloomingdale's. 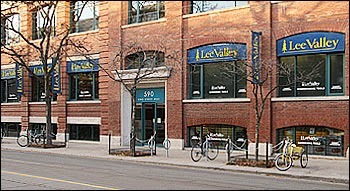 Yorkville is a cool neighbourhood to stroll around. And that's just a taste. Stay tuned, gardeners, for another post on gardens we just weren't able to squeeze into the Fling. I'll also fill you in on how to fill up on good things to eat! HUGE THANKS TO ALL OUR 2019 DENVER FLING SPONSORS!